There is no definitive data source from the government or elsewhere on how many Americans own guns or how gun ownership rates have changed over time. Also, public opinion surveys provide conflicting results: Some show a decline in the number of households with guns, but another does not. The General Social Survey (GSS), conducted roughly every two years by the independent research organization NORC at the University of Chicago, with principal funding from the National Science Foundation, provides a widely-used look at the rate of gun ownership over time. The GSS data show a substantial decline in the shares of both households and individuals with guns. 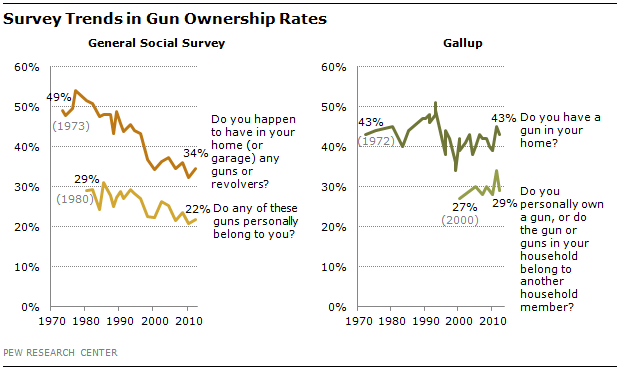 When the GSS first asked about gun ownership in 1973, 49% reported having a gun or revolver in their home or garage. In 2012, 34% said they had a gun in their home or garage. When the survey first asked about personal gun ownership in 1980, 29% said a gun in their home personally belonged to them. This stands at 22% in the 2012 GSS survey. The Pew Research Center has tracked gun ownership since 1993, and our surveys largely confirm the General Social Survey trend. In our December 1993 survey, 45% reported having a gun in their household; in early 1994, the GSS found 44% saying they had a gun in their home. A January 2013 Pew Research Center survey found 33% saying they had a gun, rifle or pistol in their home, as did 34% in the 2012 wave of the General Social Survey. The Gallup Organization has been tracking gun ownership in their surveys over this time period as well, but their trend suggests no consistent decline. A Gallup survey in May 1972 found 43% reporting having a gun in their home. The percentage subsequently fluctuated a great deal, reaching a high of 51% in 1993 and a low of 34% in 1999 – but the percentage saying they had a gun in their home last year was the same as it was 40 years earlier (43%). In the Pew Research Center survey conducted Feb. 13-18, 37% of adults reported having a gun in their household: 24% say they personally own a gun, and 13% say the gun or guns in their home are owned by someone else. These figures are not significantly different from the 2012 General Social Survey estimates that 34% of households have guns, and 22% of individuals own a gun. There is also a sharp difference in personal gun ownership by age – 16% of adults under age 30 own a gun, compared with 27% of all adults age 30 and older. However, many young people live in households in which someone else owns a gun. Roughly three-in-ten (31%) whites own a gun, which is much greater than the rates of gun ownership among blacks (15%) and Hispanics (11%). Gun ownership also differs substantially by region and type of community. In the Northeast, 17% say they personally own a gun as do 21% in the West. Higher percentages in the Midwest (27%) and South (29%) say they own a gun. Across all regions, people living in rural areas are twice as likely as those in urban areas to own a gun (39% vs. 18%). The general profile of gun owners in America differs substantially from the general public. Roughly three-quarters (74%) of gun owners are men, and 82% are white. 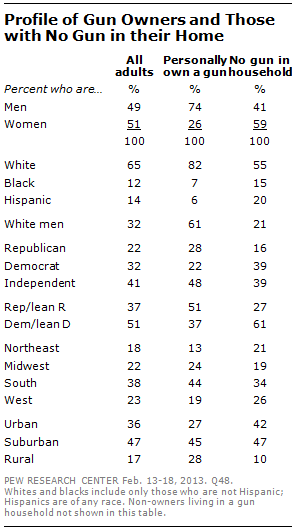 Taken together, 61% of adults who own guns are white men. Nationwide, white men make up only 32% of the U.S. adult population. Gun owners and those who do not own guns differ politically. While 37% of all adults identify with or lean toward the Republican Party, that proportion jumps to 51% among gun owners. Among those in households without guns, just 27% identify with the Republican Party or lean Republican, while a majority (61%) are Democrats or lean Democratic.